It’s hard to believe, but Mother’s Day is just around the corner! We hope that you will mark your calendar and plan on attending the annual Mt. 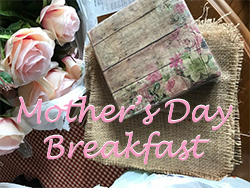 Auburn Mother’s Day Breakfast! It will be held on Saturday, May 11, beginning at 9:00 am in Trinity Hall. We are fortunate to have our United Methodist Men prepare a tasty breakfast for us! Tickets will be sold Sunday, April 21, April 28, and May 5 between services. The cost is $3.00 for adults and $1.00 for children 13 and younger. We hope to see you at this year’s breakfast!